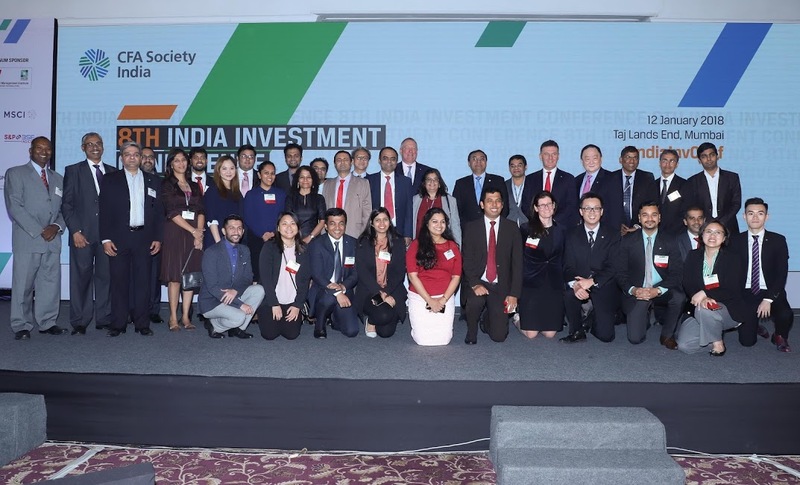 It was a great gathering of luminaries at the 8th India Investment Conference at Mumbai organized jointly by CFA Society India and CFA Institute in Mumbai on January 12, 2018. The event was very well crafted around its title – “Growth Conundrum, Opportunities and Threats in 2018”. It started with the presentation by Rupal Bhansali, CIO of Ariel Investments, on Non-Consensus Investing. This was followed by Richard Koo, Chief Economist at Nomura Research Institute, who explained the other half of macroeconomics not dealt by conventional economists & academics, a phenomenon he refers to as balance sheet recession. James McGregor, Chairman of APCO (Beijing) Consulting Company, discussed the Geopolitical Landscape in Asia as China Expands and America Retreats. The event brought in Carla Harris of Morgan Stanley who explained what it takes to succeed in the organization. Lastly Anil Gaba, Professor of Decision Sciences at INSEAD presented on Illusion of Control and its impact on Judgement while dealing with Risks and Uncertainty. Like in the past each of the speaker sessions was moderated by the industry experts and practitioners like Sunil Singhania CFA, Global Head Equity at Reliance Capital, Navneet Munot CFA, CIO, at SBIMF, Jayesh Gandhi CFA, President CFA Society India and Senior Portfolio Manager at Aditya Birla Sun Life Asset Management, Madhu Veeraraghavan, Director, TA Pai Management Institute, and Anil Ghelani CFA, Director CFA Society India and Senior Vice President DSP Blackrock. IIC18 was co-chaired by Sonia Gandhi CFA, Director CFA Society India and Anil Ghelani CFA, Director CFA Society India. Opening Keynote address of IIC18 was presented by Amit Khurana CFA, Director CFA Society India and Nick Pollard, MD, Asia Pacific, CFA Institute. Paul Smith CFA, CEO, CFA Institute gave global insights on the investment industry and roles of CFA charter holders in shaping the industy. The conference was wrapped up with closing remarks by Vidhu Shekhar CFA, Country Head, CFA Institute India. Apart from the participants, the corporate supporters of the events were Flame University as Academic Supporter; TAPMI as Platinum Sponsor; CMT, DART, MSCI, Morningstar, SBI Mutual Funds, S&P BSE Indices and Wiley as Silver Sponsors; Bajaj Allianz as Delegate Bag Sponsor, Thomson Reuters as Lunch Sponsor; Aditya Birla Sun Life Mutual Fund and Reliance Mutual Fund as Delegate Sponsors respectively. Follow Twitter with following hashtags #IndiaInvConf, #IIC18 and blogs on iaip.wordpress.com under the tab “India Investment Conference”. This entry was posted in Events, India Investment Conference, Mumbai and tagged #IIC18, #IndiaInvConf, @CFAAsia, @CFAIndia, @CFAInstitute, @CFASocietyIndia, @iaipcfa, Aditya Birla Sun Life Mutual Fund, Amit Khurana CFA, Anil Gaba, Anil Ghelani CFA, APCO (Beijing) Consulting Company Ltd., Ariel Investments, Carla Harris, CFA Institute, CFA Institute India, CFA Society India, Chetan Shah CFA, CMT, DART, Flame University, INSEAD, Ishwar Chidambaram CFA, Jainendra Shandilya CFA, James McGregor, Jayesh Gandhi CFA, Madhu Veeraraghavan, Morgan Stanley, Morningstar, MSCI, Navneet Munot CFA, Nick Pollard, Nomura Research Institute, Paul Smith CFA, Richard Koo, Rupal Bhansali, S&P BSE Indices, SBI Fund Management, Sonia Gandhi CFA, Sunil Singhania CFA, TAPMI, Thomson Reuters, Vidhu Shekar CFA, Wiley. Bookmark the permalink.